While images of Port Royal and the Spanish Main fill most people’s imagination when they hear the word pirate, the truth is, not all privateers were sailing around the Caribbean looking to capture gold bound for Cadiz. The British government imposed a huge tariff on goods coming in and out of the American Colonies that spurned a black market for cheaper goods that had been plundered from foreign vessels. At the time South Carolina was an impoverished colony that was only eager to trade with the pirates letting them move around town freely just as if they were in New Providence. 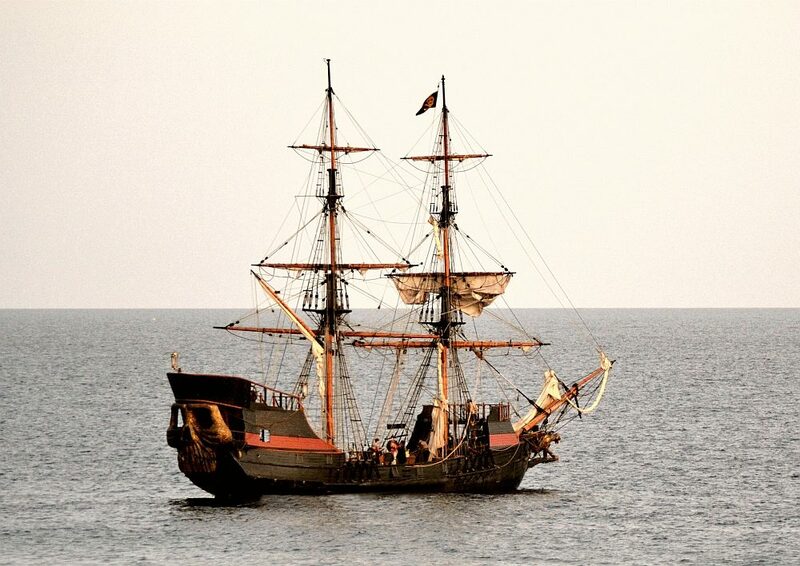 No city in the United States has a pirate history quite like that of Charlestown, South Carolina, and while places such as Key West and Savannah are often mentioned as pirate towns, neither can come close to matching Charlestown for its Historic connections to the age of piracy. A long list of names wanted by the crown for piracy preyed upon shipping in and out of Charlestown and it was not until South Carolina became a major exporter of rice and the plantation owners petitioned the British to clamp down on the privateers that anything happened. On September 5th, 1717 King George the 1st offered a clemency to all pirates in Nassau who were willing to give up their wicked ways and pledge allegiance to the crown, while also promising to settle them in the colonies if they promised to no longer take to sea. Given little choice when threatened with the noose, all the pirates chose clemency, but it was not long before they went back to their old swashbuckling ways bored with accepting the life of a poor settler. The most famous pirate to be associated with Charlestown is Edward Teach, better known as Blackbeard, who in 1718 showed up off the coast of South Carolina with an armada of ships intent on blockading the port of Charlestown. Within the space of a week, he had plundered eight ships, bringing the town’s economy to a standstill without actually having to put up a fight. Despite doing well from the captured ships, the real reason Blackbeard had blocked the port was to obtain a chest of medicine that contained mercury, the only thing at the time known to treat syphilis. Having now gotten what he came for Blackbeard turned his fleet north heading for his now home port of Bath, North Carolina. One member of the raid on Charlestown that did not fare as well, however, was Stede Bonnet, a former plantation owner in the Caribbean who took to piracy in search of adventure. Not skilled in the art of navigation and warfare Bonnet was captured by the British after a five-hour battle in the Cape Fear River and brought back to Charlestown for trial. Now tried and convicted to death by hanging, Bonnet was taken to the gallows at White Point where he and other pirates that followed were strung up until dead. Charlestown was also the home of the most notorious female pirate Anne Bonny, the hot-headed daughter of an Irish plantation owner. Having run away with a sailor Anne took up company with John “Calico Jack” Rackham, captain of the pirate sloop Revenge. When finally captured by the British, Anne and fellow female pirate Mary Read were the only crew members sober enough to put up a fight. Paraded before the Governor of Jamaica all three were convicted of piracy and sent to the gallows although a partial clemency was granted to both women due to the fact they were pregnant, with the sentence later to be carried out after childbirth. Records stated that Mary Read died in her cell, yet there is no mention of what became of Anne Bonny, with suggestions that her father paid the Governor a high ransom to spare his daughter and marry her off to a member of Jamaica’s high society. Pirate history abounds in Charlestown, with many of the old taverns and places they acquainted open to the public, giving you the opportunity to learn much more about the Golden Age of Piracy and the role South Carolina played in its history. Photos courtesy of Robert Pittman and Wiki Commons.